The most important thing you can do to assure a reliable race-winning entry is to not allow dirt from getting in your engine. 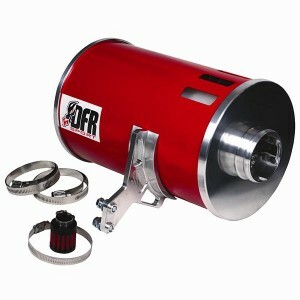 DragonFire Racing’s new canister style intake system is a full replacement for the factory intake system. It features an 80% increased in air flow as compared to single inlet filter systems. Inlet ports give 80% Flow Efficiency, no oily foam outer is required. Velocity fins remove up to 85% of the incoming dust before it reaches the filter. No oil is required on the filter element, which can cause damage to engine sensors. The filter element removes up to 99.99% of the remaining dust in the air before going into your expensive engine & components. Also the filter element is easily removed from either end. Filter end caps are machined from a single piece of high strength 6061-T6 billet aluminum, not spun aluminum! It also features a modular design, parts can be changed to increase or decrease the filter size. No drilling required to mount the filter. Mounting clamps are included. The video below demonstrates how the unit works and how easy it is to install.